Authentic social connection is an elusive concept in today’s world, because it is something that we must consciously experience, pay attention to and work at. When we consider that since the Industrial Revolution, in the late 1700’s, primarily humans have moved from a nomadic existence with a heavy reliance on relationships via close knit communities and/or tribes, daily exposure to both nature and animals, and a standard use of body language to communicate – to largely moving towards an autonomous existence that is self-reliant and goal driven, with little reliance on body language or as much exposure to nature and animals. Simply stated, the human brain has not evolved past needing warm social connection, the rhythm of nature and contact with animals over the last 300 years. Enter anxiety and depression…our brains are hungry and seeking this connection. Purposely engaging our “right” brain and/or limbic system is vital to maintaining healthy relationships, accessing intuition and creativity and being able to relax and rest. This part of our brain takes in information in context as we experience sensations in our bodies and throughout our nervous systems. In society’s fast pace, humans must slow down and realize that these sensations are being felt, recognize an emotion related to these sensations and then act. This is often something that has become difficult, if not impossible, in our non-stop world of electronic communication, lack of balance in our lives and very little encouragement to recognize and respond to emotions as part of our decision-making processes. Instead, humans have moved to a very heavy reliance on our “left” brain, which was designed to take in bits of relevant information and store it away to help manifest dreams and goals. It assembles and disassembles information, takes it out of context and uses it to control and manipulate circumstances. When this side of the brain is the default, our tendency is to become more autonomous and independent, isolated and goal driven instead of relationship driven. The sensations and emotions are still there, we are just stuffing them and our bodies are storing them to come out later! Not pretty. The goal is to integrate both “sides” of our brain. This is where true social connection comes into play, and again, this is an elusive goal that we must consciously practice. When we cooperate, interact and exchange signals with each other, we create cross-brain connections, and that is when we experience joy, satisfaction, productivity and fulfillment. Practicing what true connection feels like is necessary. But how do we do this? Enter, horses. Horses are masters at relationships. They are 1200-pound prey animals and live in herds for safety, therefore hard-wired for healthy relationships. They exist in a very interdependent way, relying on one another, respecting each other’s role in the herd and realizing that the overall health of the entire herd is primary to their survival. They live in the present and do not worry about the future or drag the past along on daily excursions. They recognize when their nervous systems are sending them signals, pay attention, act if needed and then go back to grazing. Another gift they have is clear communication! They have mastered the art of non-verbal communication, setting intention, collaborating, healthy confrontation, boundary setting and instant forgiveness. I have learned that if we allow these gracious and beautiful animals the opportunity to teach us when we are present and fully engaged, we are able to better connect with others, experience moments of relaxation and rest, be more clear-minded and productive and access our intuition and creativity. They are able to do this by using their natural ability to read our intention or energy. This is something they have used for thousands of years to determine if a predator is hunting or simply walking by. If they ran every time they saw a predator, then they would not have the energy to run when it was truly needed. 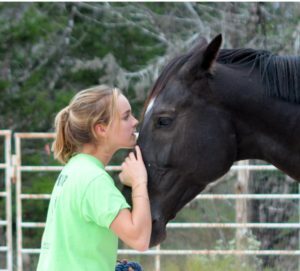 This work that we do at South Wind Equestrian and Retreat Center is truly life-changing. Humans get to practice not only re-connecting with themselves and being present, but also how to experience and the sustain authentic warm social connection. Horses do not lie. Their feedback is instantaneous and authentic, in a beautiful peaceful and safe atmosphere, free of the sounds of civilization. Once our clients experience what true connections feels like, their lives are transformed, the relationships become healthier through boundary setting, clearer communication, more self-confidence and fully experiencing life’s joys and sorrows. “Connection” is becoming a trendy expression. Books and articles are being published daily extolling the loss of connection in our society and the results of this multi-generational disconnect. Isolation, loneliness and cynicism are becoming commonplace as humans lose the ability to feel safe in community. I was recently in a large airport on a train taking me from one terminal to another and as I gazed around at the faces of the many people of all race, color and creed…in multiple stages of life, I lamented the fact that no one was eager to make eye contact or heaven forbid, start a conversation. Why have we lost the confidence to pursue connection with our community? What are we so afraid of and why? 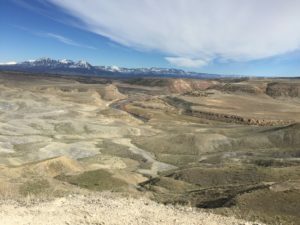 Undoubtedly the electronics age and our exit from farms and ranches in the relatively not so distant past have contributed to the behaviors we are noticing, but I truly believe that deep down in side, we are all longing for connection. Sadly, there are a lot of people out there who either never knew what it felt like to be in a truly connected relationship with someone, or it has been so long that they have forgotten how. Do you know which category you fall into? Working with humans and horses is remarkable in many ways ,but the most important lesson taught by far, is the ability the horses have to demonstrate immediately and authentically when we are present and intentionally seeking true connection. You see, their well-developed sense of literally knowing the intention of a predator and their fellow herd mates kept them alive for millions of years. If they ran every time a lion walked by, they would not have the energy or strength to run when it really counted and if they weren’t tuned in to their herd mates, then they would all run into each other as they galloped away from the hungry predator. Have you ever watched a mare and foal gallop together? It is as if they are connected to one another with an invisible string. It is truly a beautiful and graceful dance. 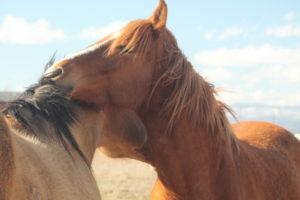 Thankfully these beautiful and gracious animals are willing and able to teach us this fine art of connection for healthy relationships. We work with a single horse and a single human on the ground in a suitable and safe space with no ropes or halters to limit the horses ability to choose whether or not to be in relationship with the human. It is quite intimidating to some, to have a 1200 pound animal share the same space with seemingly no protection. But, once it is established and realized that horses are hard wired for healthy relationships and are prey animals with no motivation to be aggressive, we get to watch the dance unfold. Simply by using our energy to put pressure, or communicate intention, onto the horses body, we are able to use non-verbal communication in a focused way to request that the horse recognize we are there and want to have a relationship. We encourage our human dance partners to experiment with how much pressure to use and where to put the pressure on the horse to give it the most opportunity to respond. This work we do has a purpose and that purpose is to help humans connect with humans in a more intentional and authentic way. Therefore, we guide our clients through appropriate ways to understand what it feels like to be present, what incremental increases in pressure feel like, how to differentiate between ignoring and resistance, as well as cooperation and compliance. All of these skills help humans become more attuned to themselves and to others in human relationships. For example, would you walk right up to a stranger and start patting their face? How about offering them a slice of apple? Brushing their hair? Most likely no. Being present in an authentic way is safe, and intentionally asking a horse to be in relationship and getting immediate feedback, is something hard to duplicate in the human world. Here the human is safe to practice what it means to be present, learn how it feels to make a request and stand in the request even when met with resistance, enjoy a no-strings-attached relationship free of hidden agendas, boldly standing within and defending safe boundaries and learning that boundaries are actually great for healthy relationships and learning what true connection feels like! Once true connection is felt and established, euphoria follows. Remember when we are in a truly connected relationship dopamine is released into our system and it feels so good for us and for the horse. Imagine a world where we are truly seeking connection with our spouses, children, friends, co-workers and even strangers. We would find that elusive thing called joy; that thing within ourselves that can only be satisfied when we are truly seen and heard and safe. So, I continue to read books on connection and isolation, joy and pain. And the common thread that runs through it all is finding yourself and trusting your soul/energy/Holy Spirit to guide you through this journey called life. Gain courage from your own intuition again, stand bravely before the unknown and trust yourself and others in a deeper and more meaningful way. What better way to learn how to locate this elusive concept than with another sentient being, a horse.